The swallows have raised a brood and today the babies made their first foray into the air. They are so beautiful but like toddlers, still a bit uncertain in their movements, if considerably more graceful. The cats are enthralled but I think even clumsy swallows will be too quick for them. These pictures are some that Paul took last year, he has the patience and the camera skills that I lack. 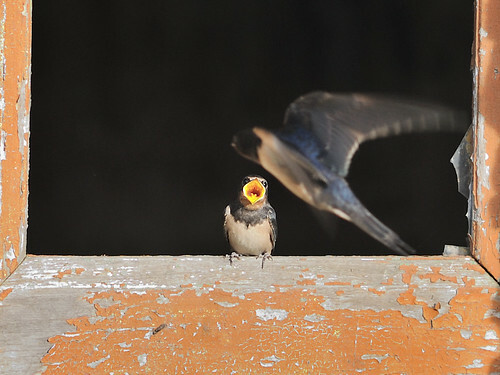 Lovely swallow pictures. Several years ago we lived in a house with a covered porch. Swallows made a nest tucked up in a protected spot every year. We loved to watch them raise their babies. And we were always reprimanded with a swoop and a peck if we got too close. What amazing photographs! It's supposed to be lucky if swallows nest in your house. ICQB - this year's swallows have got rather full of themselves and mob the cats if they spot them in the yard. So far, cats are just cowering but the swallows come so close I'm dreading the moment when someone makes a jump, they're terrible fast, these kittens. Cottage Smallholder - we certainly feel very lucky. It's such fun to watch them doing their tricks.